I reviewed an infrared laser BBQ thermometer a few days ago. While testing it out, my geeky gene activated (as it should when one plays with a laser with a digital display) and I was reminded of a mask. Why a mask? Well….. Yes, that’s me…. 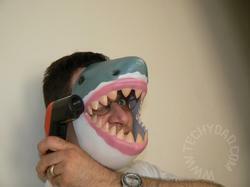 wearing a shark mask… with a laser "attached" to my head. And yes, I know I’m a geek! You are one silly duck… I mean shark! Fun shot! LOL! That’s awesome. You are a rockin’ dad for sure! .-= Rhea´s last blog ..It’s Official – I’m a Grown Up =-.